This office also has a package of Braille and large-print Capitol-related materials and an audiotape of the public Capitol tour. 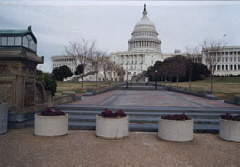 A table‑top relief map showing the area from the Library of Congress to Union Station, including the Capitol Hill area and the Mall, is located at the CSSO in the crypt of the Capitolappointments are required to reach the office. Identical maps can be examined inside the South Capitol entrance of the Rayburn Building, ground floor, and outside the Disbursement Office on the first floor of the Hart Building. Planned giving takes place when a contributor decides to leave a substantial gift to charity. It means planning as you would for any substantial purchasea house, college tuition, or car. The most common forms of planned giving are wills and life insurance policies. There are also several planned giving options through which you can simultaneously give a substantial contribution to the National Federation of the Blind, obtain a tax deduction, and receive lifetime income now or in the future. For more information write or call the National Federation of the Blind, Special Gifts, 1800 Johnson Street, Baltimore, Maryland 21230-4998, (410) 659-9314, fax (410) 685-5653.